Most of our trips tend to be quick journeys over the weekend, or slightly longer trips over a long weekend, but sometimes we like to take the time for a longer road-trip. By the middle of 2016 we had already explored fairly well the area around Dallas that could be easily reached over a weekend. We were having to drive three hours or more to get to an area we hadn’t already visited. As part of her volunteer work, Ren was having to attend meetings in Austin once a quarter, always on Wednesday mornings. This offered us the opportunity to use Austin as a jumping off point for a longer adventure. So it was that on June 14th we set off on one of our longer road-trips. 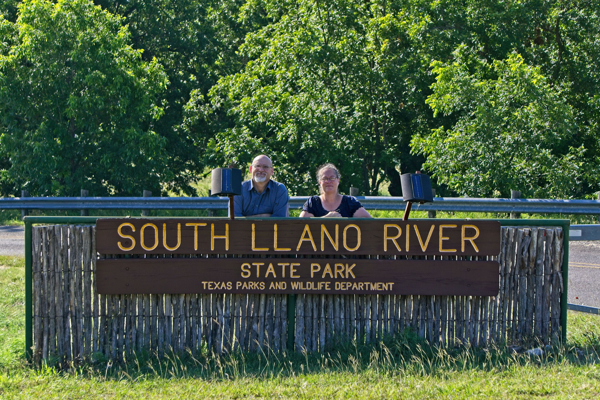 Wednesday afternoon, we left from Austin headed toward the first stop on our journey, South Llano River State Park, just outside of Junction TX. This is a pretty little riverside park with a nice swimming hole. We arrived in the early afternoon, spent some time exploring the park, before going for a swim in the river. The water was very clear and cold. Perfect for cooling off on a hot June day in Texas. The park has hiking trails, a wild turkey flock, and you can rent rafts and kayaks in Junction and float down the river to the park, where they will pick you up at the end of your trip. This park is an International Dark Sky Park, and an excellent place for stargazing. Light pollution is increasingly a problem in the developed world as the city lights drown out the night sky making it very difficult for many people to experience the wonder of the universe under a truly dark sky. South Llano River has very dark skies. Unfortunately due to the timing of our trip moon was too close to full for the viewing to be very good when we were there, and it was also a bit cloudy, I stayed up that evening to take some photos, but none of them were worth sharing. After breakfast we set out the next morning headed west. The further west we went the more rugged and interesting the landscape became. This was our first trip into far west Texas, and we soon found ourselves asking why we had waited so long. Every region of Texas has its charms, but there is something special about the mountains. Ren and I were both awed by the beauty we found in West Texas. After many hours of driving, we reached our first destination of the day. Balmorhea State Park, just outside of Balmorhea Texas. 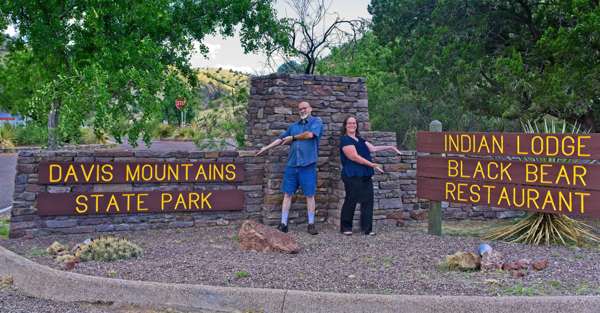 This unique park is in the foothills of the West Texas mountains, built around the San Solomon Springs, it is an oasis in the desert. In the 1930’s the Civilian Conservation Corps took this spring and made it into a huge swimming pool. Up to 30 feet deep in places, the cool, crystal clear waters flow up from the bottom of the spring at a rate of 25 million gallons a day and flow out through canals to irrigate the surrounding countryside. We were both surprised to find it home to fish and other underwater creatures. The waters maintain a temperature of 72 to 76 degrees year round. We expected to find this a refreshing stop, and we did, but we did not anticipate how beautiful the setting was. After our swim, we headed for our ultimate destination, Davis Mountains State Park (DMSP), just west of Fort Davis Texas. Located in the Davis Mountain range, Davis Mountains State Park, (DMSP), is actually two Parks. DMSP and Indian Lodge State Park. Indian Lodge is a full-service hotel located within the larger park. Built by the Civilian Conservation Corps, (CCC), in the 1930s. 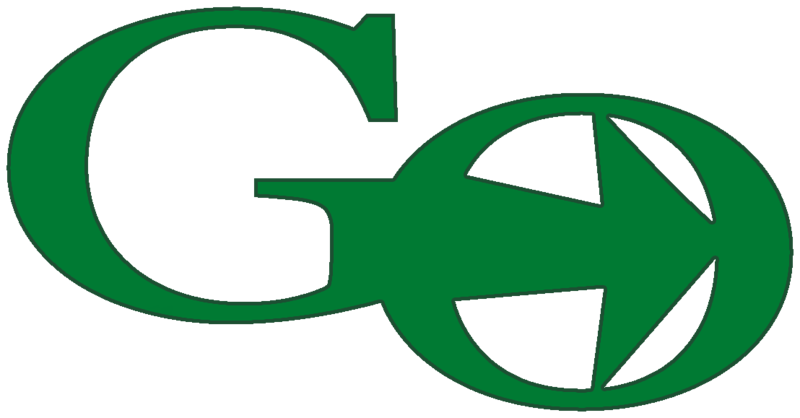 It serves as a getaway for those who want to visit this area without giving up their creature comforts. We are not averse to traveling in comfort when the budget allows, but for this trip, we were camping. We arrived after the office was closed, but we had already reserved our campsite online. We went to the bulletin board and found our site number. In most Texas State Parks we have visited, they mark which sites are reserved, and you are free to choose from those remaining sites. We were not used to having a site assigned to us, but we were happy enough with the site once we found it. On arriving at a new park, we always drive through the park to get a lay of the land. The office was closed, but we were able to pick up maps and ask questions at the Indian Lodge desk and gift shop. After driving through the park, we set up camp. We had been concerned about the heat, being June in West Texas. We needn’t have worried. DMSP is between 5,000 and 6,000 feet above sea level, and being in the desert, the humidity is low. The days were warm but not excessively so, and the nights were downright chilly, getting down in the 50s. Having done our research, we were prepared for the local wildlife. While it has been many years since a bear has been sighted in DMSP, they do have a large population of Javelina. Javelina are a large pig-like animal. They are generally not dangerous to humans if left alone, but they can be dangerous if threatened. In the evening we heard them rummaging through our camp looking for food, but we had made sure to secure any food and garbage in our truck before going to bed. Our neighbors had not been so wise, and while they were away their camp was destroyed. Friday Morning we drove into the Town of Fort Davis to have breakfast. There we found a nice little restaurant at the Fort Davis Drug Store, which is actually a gift shop, restaurant, and hotel; however, this was the actual site of the Drug and General Store during the days of Fort Davis. Their cheesy hash browns are one of the best things I ever ate, easily as good as the baked potato casserole at the Natty Flats Smokehouse. We ended up eating all our breakfasts there. 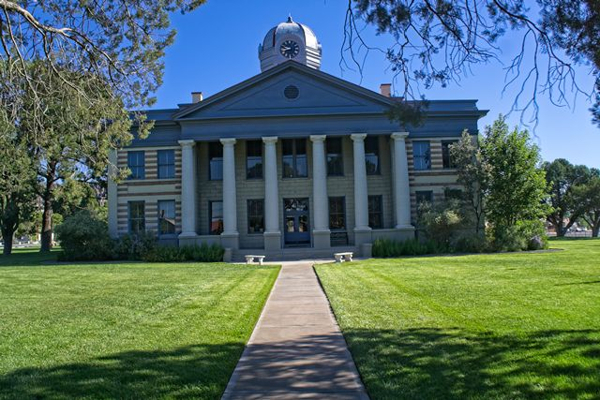 Fort Davis is the country seat of Jeff Davis County, so we had to go visit the courthouse. It is a picturesque Courthouse with a lot of historical information inside as well as some interesting wood carvings and hand embroidered quilts. Well worth the time to visit. We very much liked the town of Fort Davis. It is a small place and mostly survives on tourism, They do a good job of making you feel welcome. The reason they get so much tourism is that within the town of Fort Davis is the Fort Davis National Historic Site. This is a well-preserved frontier fort from the era of the Indian Wars, active from 1854 to 1892, Fort Davis was built to protect settlers and freight on the Trans-Pecos portion of the San Antonio-El Paso Road. The Fort, the town, and the county were named for Jefferson Davis, Secretary of War when the fort was established. Much of the housing and several other buildings survive, and there are many exhibits built to help explain life on the frontier. Visiting here you find yourself trying to imagine what it was like to live in this beautiful but harsh country without the benefits of air conditioning other modern conveniences. As the day was warming up, we decided to take advantage of one of those modern conveniences, Air Conditioning. We set out to drive the Davis Mountains Scenic Loop. The Davis Mountains Scenic loop is a 75-mile loop that begins in Fort Davis, heads west into the Davis Mountains on Highway 118, before turning south on Highway 166 which will bring you back to Highway 17 and Fort Davis. The Davis Mountains are an ancient range of volcanoes, with many rugged and beautiful peaks. The Davis Mountains fill a rough square about 31 miles on each side. The Scenic Loop is one of the best ways to appreciate this amazing area of Texas. It takes 2 hours to drive if you do not stop, it took us more like 4 hours as we stopped frequently to take in the views. Once we got back to the park we headed over to Indian Lodge to have a great dinner at the Black Bear restaurant. I highly recommend that you have at least one meal there during your visit. The service was wonderful and they made sure Ren had a gluten-free chicken fried steak and gravy. Having a few hours of daylight left we explored more of DMSP. In addition to the Javelinas, DMSP is a haven for birds. They have a nice bird blind but there wasn’t much activity while we were there since it was later in the day when the heat is up. The highest peak in the park is Lookout Mountain. You can drive to the top where there is an observation area with a great view in all directions. From there you can see McDonald Observatory to the west and Fort Davis to the east. You can drive nearly to the top, where there is a small parking lot. Nearby is an old CCC-built shelter giving you cool shade to take time to enjoy the amazing view. One of the hiking trail leads to the top of the mountain, then continues on, out of the park and down to Fort Davis. Neither Ren or I were in shape enough to do much hiking in the heat of the day, but the trail is clearly marked and well traveled. The lookout closes at sunset, but for a small fee you can stay up after hours. Here you can watch the sun dip down below Mount Livermore and show off McDonald Observatory. We did just that, sharing a nice sunset with some of the local wildlife. and took the time to shoot a short video. It was actually very relaxing and we spent plenty of time appreciating the view. This is one of the darkest areas in the state and is an outstanding area for astronomy, however, it was nearly a full moon so the stargazing was not the best. Still, I took the camera to see what I could get, while Ren took the air mattress so she could sleep in the back of the truck. We met another photographer named Jim, who was also staying on the mountain, and he and I visited and took pictures, while Ren slept. While Jim was shooting star trails, I took a series of long exposures of the lights from the cars returning to the park from the Star Party at the Observatory. We hadn’t been able to get tickets for the Star Party; however, we were able to visit the observatory the next day. At one point while we were taking pictures, a deer walked between us, then walked around the truck where Ren was sleeping and looked in curiously. She seemed to have no fear us at all. After a while, we headed back down the mountain to get some sleep. We had another big day ahead, but this post is getting long, so I will save that story for another post.